We meet Kate Evans, protagonist of Touching the Clouds, on the day that was supposed to be her wedding day. A week before, she had told Richard, the man she was to marry, that she feels a need to move to Alaska to become a bush pilot. Richard is hurt and not ready to give up on marrying her. Her parents don't completely understand, either, and it's hard for Kate to explain. She likes Richard a lot. She doesn't enjoy hurting him. She just doesn't think she loves him enough to marry him. Kate wants to get away from all that reminds her of the awful day she "killed" her best friend Alison. Kate was seventeen then. She had talked her friend into flying with her in her father's plane. The weather had been fine, with clear skies, when they started out. But when they got to Rimrock Lake it was foggy. She didn't turn back even though she knew she should. They had crashed into the lake, which sucked the plane down into the icy waters. For seven years Kate has blamed herself for Alison's death and is sure everyone else in town blames her, too. She want to go where no one knows about the accident. Image in Public Domain Edited with Text from Touching the Clouds by Bonnie Leon. As long as I stay here, everything is about the past. I need to start over in a place where I can prove myself, a place where I'm free to live without shadows of that horrible day dogging me. Now, as she's about to get into her Bellanca Pacemaker and head for Alaska, she leans against her father Bill -- the one who taught her to fly and has always understood her. Her feelings are mixed as she prepares to leave her parents and the apple farm in Yakima. The angry roar of Richard's truck as he left moments ago, after one last attempt to keep her home, still sticks in her mind. She wonders if she will regret her decision. She climbs into the plane. Her father cranked it for her, she pulled on her helmet, and checked the gauges one last time, and took off. The year was 1935. When Kate landed in Anchorage, she spent the first night in a hotel she could not really afford. The next day she applied for a job at the local mercantile. She knew she probably wouldn't get a job as a pilot right away and meanwhile she would need to support herself. When Albert Towns, the owner of the store, interviewed her, she admitted she really wanted to be a bush pilot, but recognized that probably would take some time. Albert and his wife Helen were OK with that, saying that if she found work as a pilot, she could work part-time around her flying hours. The couple also said she could stay in a room at the back of the store. The arrangement worked well for all of them. They became close friends. One of the first customers Kate helped in the store was Paul Anderson, who lived in Bear Creek in a rather isolated cabin. He came to town a couple of times a year to stock up on supplies. He had come from San Francisco but no one knew much about why he came to Alaska. The reader learns his wife back home, Susan, had died. No one knew how he had earned his living in California. In Bear Creek he was trapping animals for their meat and fur. The reader can sense that Paul finds Kate fascinating, and Kate admits to herself he is handsome and intriguing. One wonders if this is the beginning of a possible new romance. 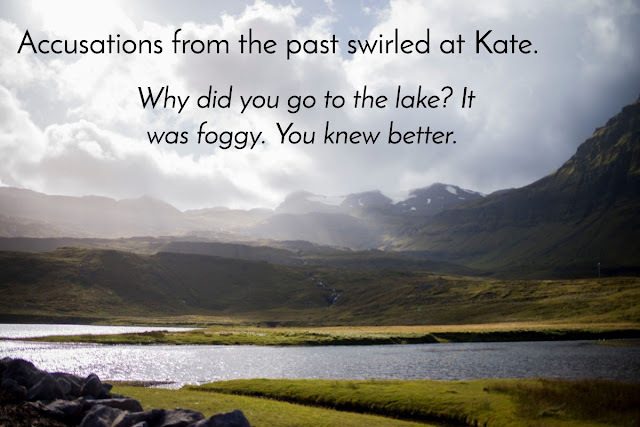 When Paul learns that Kate wants to work as a pilot, he suggests she try the new airfield at Lake Spenard. She had already tried Merrill Field with no success. They didn't need any more pilots. Kate applies at Lake Spenard. Although the interview was tough, Sidney Schaefer tests her in the air, and hires her part-time for a mail run. The current pilot filling in for the mail run, Mike Conlin, was to train her the next Monday. 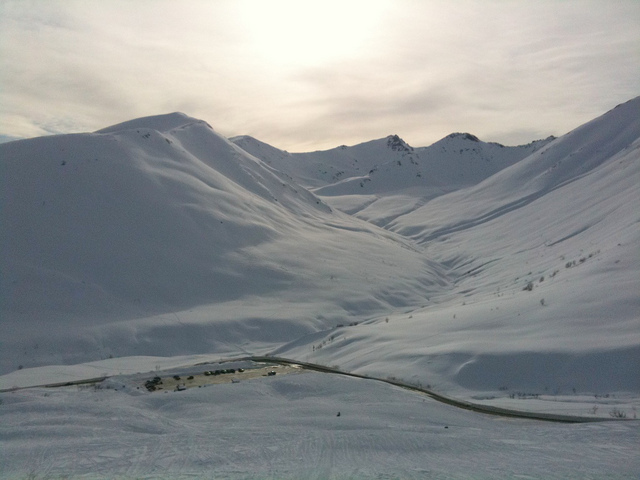 This is the terrain of the Chugach Mountains Kate flew over near Anchorage. Kate soon got used to the mail run, and looked forward to giving people their mail, especially Paul and his neighbors -- Patrick and his wife Sassy and their daughter Lily. Paul felt uncomfortable with Lily because he knew Patrick and Sassy wanted him to marry her and he didn't want to. Sassy was always sending Lily over with food, or to help. Paul was polite, but he didn't want to encourage her. Paul was fighting his attraction to Kate because he didn't want to give his heart away again. Falling in love would make him vulnerable to hurt again. He knew Kate's work as a pilot was dangerous, and he could lose her, just as he'd lost his wife. Kate proved herself capable on the mail run, and Sidney began to let her carry passengers. Her first opportunity was a rescue flight to check on hikers at McKinley Park who should have gotten in before the sun went down. She was called in early morning to go search for them. She found them just before her fuel got low enough to necessitate turning back. That made her more sure than ever that she would not return to Washington and Richard, who was still writing and begging her to come back. She knew she belonged in Alaska, flying as a bush pilot, fulfilling her dreams. Kate got to play Santa Claus before Christmas. She flew to Kotzebue, 549 air miles northwest of Anchorage, to bring Christmas packages to that small town. She had made friends with the owner of the airfield Joe Turchick and his native wife Nena on her first visit. She had arrived on Halloween and Nena invited her to go trick or treating with her and her children. Since then she'd stayed overnight with them on her trips there. It was like her home away from home in Kotzebue. Nena was afraid to fly. After the Christmas trip, though, she asks if Kate will take her to visit her sister in Candle, who is about to have a baby. She overcomes her fear when she sees how beautiful it is to look down at the scenery. She decides she actually likes to fly. Most of Kate's trips were uneventful, but some passengers put her and everyone else on the plane at risk. It's hard to handle drunk hunters bigger than you are and fly a plane at the same time, especially when the drunkest one opens the door in the back of the plane . One woman lied about about how far her pregnancy had advanced and actually gave birth in the plane. Kate knew nothing about bringing babies into the world, but she had to find a place to land and deliver the baby. Kate had many close calls. 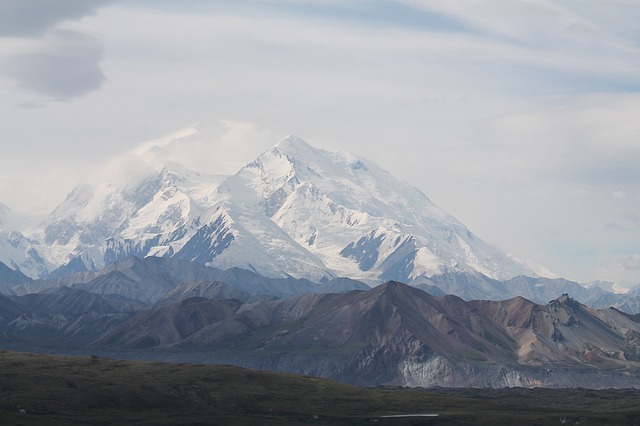 On one occasion she left on a mercy flight with a nurse to pick up a miner in Hatcher Pass who had fallen, was seriously injured, and needed to get to a hospital. The weather conditions were so bad that Jack, the other pilot there on call refused to go and called Kate a fool for going. Kate wound up agreeing with him when after flying in the fog she discovered she was off course. Her compass was malfunctioning. She had to find a safe place to land and wait for the fog to clear. Meanwhile, everyone at home was worried. Unfortunately, when the fog cleared they found that the miner had died. None of the pilots could afford radios in their planes, so when pilots had trouble, there was no way to contact anyone to report their locations. After each close call, Mike, who was getting to be a close friend, comforted Kate. His interest in her was obvious. Paul's reaction to Kate's close calls was to withdraw. One of Kate's fellow pilots, one of the best, crashed and did not survive. The loss hit Kate and the other pilots hard. Nena finally made it to Anchorage. She had a wonderful time. As Kate was taking her back home to Kotzebue, they passed Mt. Susitna, also known as the "sleeping lady." Kate veered from the flight plan a little to give Nena a closer look. That's when Nena smelled something, and Kate saw a drop of oil on her windshield. Memories of Rimrock Lake came rushing back. Below is a photo of Mt. Susitna from Cook Inlet, the location Kate was flying over when this happened. You will have to read the book to find out what happens next. 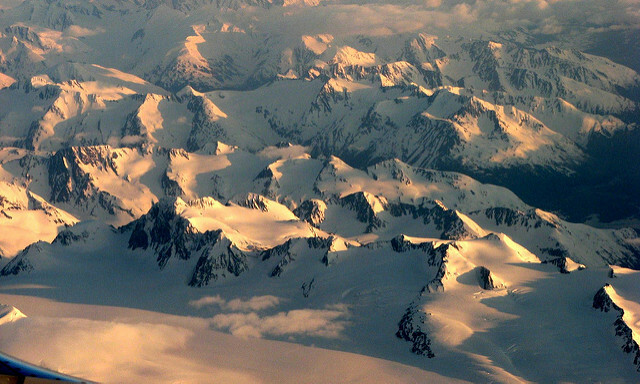 The first decision, the one Kate had already made, was to stay in Alaska and fly. She had learned that she did not want to live an ordinary life. She had told Richard she would not be coming back to him. She knew he would not want to live in Alaska. Kate had been dating Mike, her fellow pilot. He was protective of her and a good friend, but she did not think she was in love with him. She was eager to know Paul better, but although he sometimes seemed attracted to her, he would keep withdrawing. They had some great experiences together, but then he would avoid her again. She knew she was attracted to him. She is pretty sure Mike wants to marry her. He has given her plenty of hints, but she just isn't ready. She knows she needs to decide soon, because she doesn't want to lead him on if she knows it won't work. I found it hard to put his book down. The characters were well-developed, and every one of them was necessary to the plot. I appreciated that I had time to get to know them in small batches instead of having too many being introduced at the beginning and having to try to keep them straight. I enjoyed learning more about Alaska and aviation in 1935. I enjoyed getting to know Kate. She is the sort of person you can imagine having as a friend. She is brave, kind, and stubborn. She is willing to take risks, and sometimes takes foolish risks that land her in trouble. The characters are realistic and complex. Kate and Paul individually have guilt and fear to overcome in order to become whole again. Kate trusts in God. Paul has given up on God. Even minor characters, such as the drunk hunters, and the pregnant woman come alive through Bonnie Leon's words. So do the other pilots, Jack and Frank. One of the mysteries in the book is Paul. No one knows why he came to Alaska. No one knows much about him. Patrick knows his wife died. Paul eventually also shares that information with Kate under duress.The author gives the reader enough clues to get close figuring out who he really is. The author is very good at foreshadowing what will happen without really telling the reader. An alert reader is able to pick up the clues and be on the alert for what will follow. 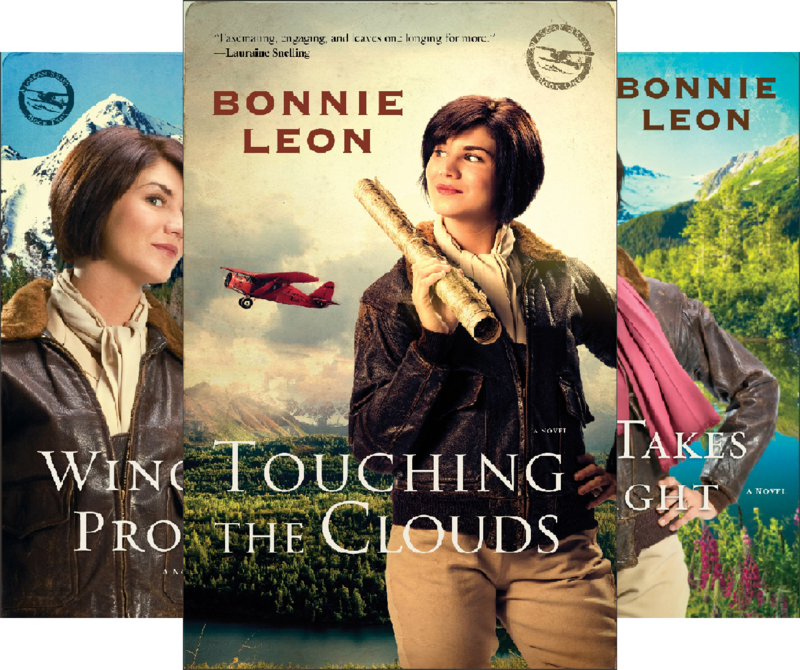 I would recommend this Christian novel to anyone who likes adventure stories, aviation, strong women, Alaska, and/or a touch of romance. I am anxious to read the rest of the series. I hope I've been able to interest you in these books, too. I would suggest you get the set so you can just keep reading after you finish Touching the Clouds. I don't think you will want to stop. Just click below if you want to buy them. Here's one last photo that's designed to Pinterest specifications if you'd like to pin it. Wow Barb, you really have me intrigued! I found I wanted to go buy the book right now! Love the name too, Touching the Clouds. Thanks for the review. If you're lucky, it might still be free. I really enjoyed the read! Looking forward to the other two books. What a great review Barbara! You certainly made me want to read the book(s). 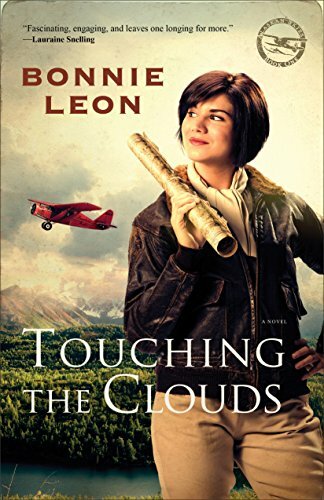 I imagine a lot of pilots feel they can touch the clouds so that certainly seems the perfect title for this book. It made me wonder if there really were female bush pilots in Alaska. It seems like a pretty dangerous job for anyone especially a woman of slight build. Not that flying a plane requires excessive physical strength, but I would think rescue in that region would require a physically strong individual. Excellent review! Kate was physically very strong. In her job at the store she had to hoist around 50 pound bags of bulk food. I think her toughest situation was with the drunk hunters, especially the ringleader who did not comply when she issued orders for the sake of safety. They were lucky to get back alive. She proved her strength many times during the book. 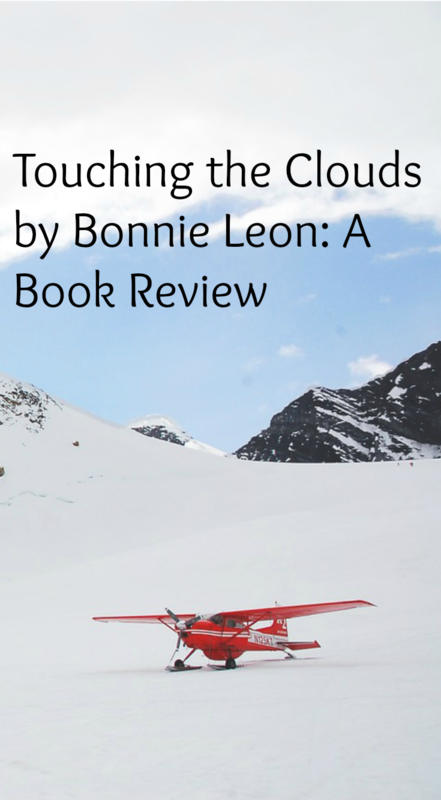 Touching the Clouds seems a very apropos title for a book whose main character is a pilot. From your interesting review, I can just imagine what life was like for a woman pilot in 1935 Alaska. Now I'm intrigued and want to know how everything turns out for Kate and Paul and the other characters in the story. Elf, I tend to shy away from adventure stories, but this one made me curious. It was hard for Kate to get hired because she was a woman. She had to work much harder than a man to prove herself. For me, of course, it's always the human interaction that I find most interesting. The author is accomplished when it comes to showing rather than just telling. You really feel you are watching. I like the idea of a female pilot in 1935, and Alaska really adds to the sense of adventure. Just added the book to my reading list (and my Kindle). Thanks for the review! Susan, I hope you enjoy it as much as I did. Excellent review Barb. Very intriguing! So I wonder, does she Marry Mike, lol - she's been brave to follow her heart's desire, her independence in life and it's funny how in the end, I still want to know, does she decide to marry. That book sounds exactly like one I would like to read. Great review, enjoyed reading it.